On the 29th (Sun), tour the pleasant surroundings at Kovalam Beach, enjoy the sand and surf at Lighthouse Beach, then steep yourself in history at Beemapally Mosque, and finally admire the landmark architecture of Sree Padmanabhaswamy Temple. To find reviews, photos, other places to visit, and other tourist information, read Kovalam trip itinerary planner. Toronto, Canada to Kovalam is an approximately 28-hour flight. The time zone changes from Eastern Standard Time to India Standard Time, which is usually a 10 hour difference. Traveling from Toronto in October, things will get warmer in Kovalam: highs are around 36°C and lows about 29°C. Finish your sightseeing early on the 30th (Mon) so you can travel to Munnar. Kick off your visit on the 30th (Mon): admire the engineering at Mattupetty Dam, take in nature's colorful creations at Rose Gardens, and then take in nature's colorful creations at Tea Gardens. To find where to stay, ratings, more things to do, and more tourist information, read Munnar trip planner. You can do a combination of taxi and flight from Kovalam to Munnar in 3 hours. Alternatively, you can do a combination of taxi and bus; or drive. In October, plan for daily highs up to 36°C, and evening lows to 27°C. Finish up your sightseeing early on the 31st (Tue) so you can go by car to Kochi (Cochin). 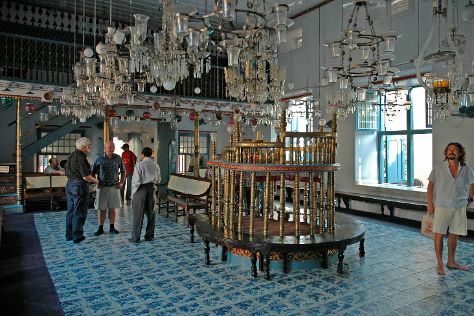 On the 31st (Tue), make a trip to Kadamattom Chruch, take in the spiritual surroundings of Paradesi Synagogue, then admire the striking features of Mattancherry Palace, then explore and take pictures at Kerala Kathakali Centre, and finally admire the striking features of Santa Cruz Basilica. Get ready for a full day of sightseeing on the 1st (Wed): wander the streets of Jew Town, look for gifts at Kochi Books, then contemplate in the serene atmosphere at Church of Saint Francis, then don't miss a visit to Chinese Fishing Nets, and finally stop by Waltons Boutique. To see ratings, more things to do, maps, and other tourist information, go to the Kochi (Cochin) vacation planner. Traveling by car from Munnar to Kochi (Cochin) takes 2.5 hours. Expect a daytime high around 36°C in October, and nighttime lows around 28°C. Finish up your sightseeing early on the 1st (Wed) so you can travel back home.